This year’s World Population Day, established in 1989 and celebrated on 11 July, marks the 50th anniversary of the 1968 International Conference on Human Rights. In this conference, family planning was affirmed a human right and it was stated that “Parents have a basic human right to determine freely and responsibly the number and spacing of their children”. 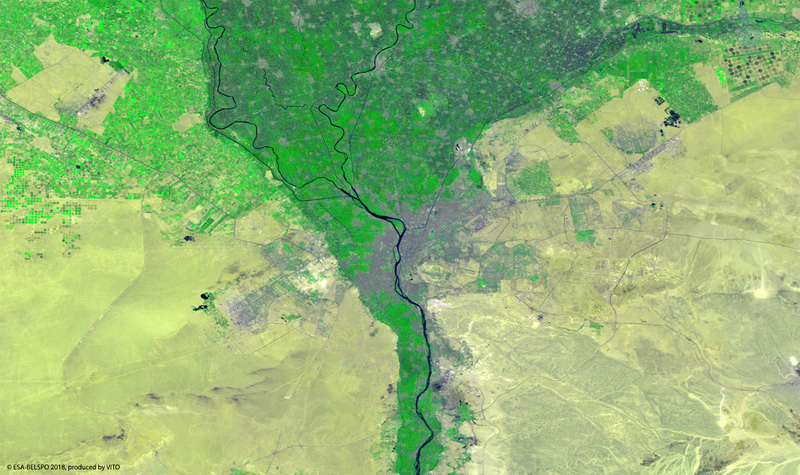 The 100 m image of 19 May 2018 shows Cairo, the capital of Egypt and one of the most populated areas in the world. It has about 20 million inhabitants and is located in the Nile Delta, which has an extent of about 25,000 km2. The city and recent urban extensions to the west and east show up in the middle part of the image. To the northwest and northeast, large areas of irrigated land are visible in light green, while in the southeast the mountainous desert and some wadis can be seen.